Anti-riot police officers clash with people protesting against President Abdelaziz Bouteflika, in Algiers, Algeria, March 8, 2019. 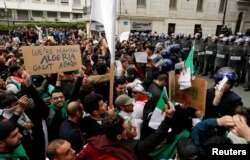 Arab media are reporting that Algerian security forces cut transportation links between parts of the country and the capital, Algiers, on Friday, as opposition groups held large protests against ailing incumbent President Abdelaziz Bouteflika seeking a fifth term in office. Arab news channels broadcast live video of the demonstrations, which showed Algerian security forces blocking the road to the presidential palace as protesters attempted to approach the landmark. Witnesses say rounds of tear gas were fired to hold back protesters. Despite conflicting reports by Arab media Thursday about the whereabouts of the ailing president, it is believed Bouteflika remains in a Geneva hospital, where his health is the subject of speculation. Al-Arabiya TV reported that Algerians have been calling the hospital switchboard to inquire if the president is still there. Police members stand guard as people protest against President Abdelaziz Bouteflika, in Algiers, Algeria, March 8, 2019. Algerian media showed video of lawyers protesting in front of the main courthouse in the large eastern coastal city of Constantine. Lawyers in several major cities have threatened not to participate in supervising presidential elections if Bouteflika runs again. Algerian TV ran a statement — attributed to the president — hailing the role of women in the country on International Women's Day. The statement also alluded to the importance of security in the country, given the "bloody civil conflicts prevailing in neighboring Arab states." Some media reports claimed that several members of Bouteflika's political party have resigned from parliament, but his supporters said the reports were not true. Algerian commentators speculated about possible scenarios for a "peaceful transition," given Bouteflika's wavering health. Analyst Noureddin Khattal told al-Arabiya TV that "two possible scenarios are being floated by political leaders." One scenario, he says, "is that the president steps down, handing power to the head of parliament." He said another possibility is that the president is asked to step down for health reasons, as per Article 102 of the constitution. Algerian Army Chief of Staff General Ahmed Qaid Salah has said several times during the past week that the army "will not allow the country to fall into to a state of chaos."